The so-called YOLO killer has struck again say Montreal police. "Jonathan Wrigley of Trois Rivieres was celebrating his birthday on Crescent street when he was struck in the head with a small hatchet," says Sgt. Lachance. "According to the witnesses of the brutal murder, Mr. Wrigley had just finished yelling the word YOLO out loud when a man in a yellow trench coat ran up and attacked him." This isn't the first time the YOLO killer has struck, and his modus operandi hasn't changed much since he first started attacking his victims in 2011. "He's kept a fairly consistent pattern," says forensic psychologist Carolyn Lemieux. "He stalks well known party districts in Montreal, looking for people who yell out YOLO. When he hears the word, he pulls out his hatchet and attacks his victims until they're dead." 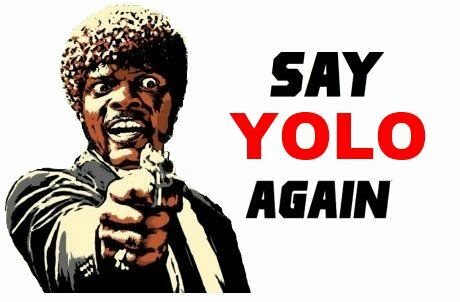 The YOLO killer has murdered eighteen people in the last two years. "All of his victims have been under 25, most of them are male, all of them have swag. He's very particular about the people he kills." Police so far have not been able to catch the man, despite the fact that he wears a bright yellow trench coat that makes him very easy to spot. "I honestly think that the police just don't want to arrest him," says Ellen Troy, Mr. Wrigley's girlfriend. "They think the YOLO killer is doing is a public service by weeding out the gene pool of undesirables. It's eugenics by serial killing, it's disgusting. Jonathan might have been kind of obnoxious, but that doesn't mean he deserved to die just because he liked to yell YOLO now and then." One Montreal police officer to spoke to Rave News off the record. "The police commissioner has an unofficial hands-off policy vis-a-vis the YOLO killer," says the officer. "If ever he starts killing non-YOLO yellers, we'll bring the full force of the law down on his back, but for now, the police department is taking a hands off approach."